Where can you hear interviews with Oliver North or Noam Chomsky — then a show called “Music to Go to the Dump By”? Which station on your radio dial will still “interrupt music programming to tell you about a lost collie”? That description of Waterbury-based WDEV (550 AM/96.1 FM) comes from Jack Donavon, host of the station’s “Friendly Pioneer” show. It appears in a new documentary called Tune in Tomorrow, by Ed Dooley of Waitsfield. His 56-minute tribute to Vermont’s oldest locally owned radio station premieres on Wednesday, July 23, at 7 p.m. in South Duxbury’s Harwood Union High School auditorium. 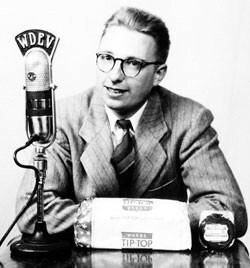 Dooley uses interviews and historical footage to tell the story of WDEV, which hit the airwaves in 1931, when the country was still in the grip of the Depression. Current owner Ken Squier explains why his father Lloyd and entrepreneur Harry Whitehill founded the station: “More people could hear than could read.” The St. Onge siblings of Westfield, now in their late seventies, talk about singing in the WDEV studio as a group of tow-headed youngsters called United Farmers’ Kids. (Music was recorded live in those days, while news was “my dad reading from the paper,” says Squier in the film.) Senator Bernie Sanders recalls coming to Vermont decades ago and hearing local poetry on WDEV. Several interviewees remember the day station manager Rusty Parker died — on the air. Dooley, who’s made other community-focused docs with his company Mad River Media, “became a fan” after appearing as a guest on WDEV shows, he says. He pitched the notion of a film celebrating the station’s 75th anniversary to Squier, who at first “didn’t seem too interested.” But he came on board after Dooley started gathering WDEV testimonials from such local luminaries as novelist Chris Bohjalian and environmentalist Bill McKibben. (McKibben describes “Music to Go to the Dump By” as “the last truly funny thing on the radio.”) Montpelier’s National Life Insurance, one of the station’s very first advertisers, helped underwrite the project, which took Dooley two years to complete. Tune in Tomorrow is scheduled to air on Vermont Public Television on August 2 at 5:30 p.m. and August 6 at 8 p.m.